SOE have just released this snazzy new video and a few snaps of their brand new DLC for DC Universe Online entitled ‘War of the Light‘ which is out now! “Players are getting more than just a new storyline with this DLC. We transformed Metropolis for the War of the Light trilogy and created new, expandable environment and content – separate from the original – for players to explore,” said Jens Andersen, Senior Creative Director for DC Universe Online. In War of the Light Part I both heroes and villains can utilize Rage powers, a unique and challenging power set that offers a new tanking mechanic, adding yet another dimension to fights. It looks amazing and I’m looking forwaWar of the Light – Part I is the first of three upcoming DLC packs revolving around characters able to manipulate the power of the emotional spectrum. 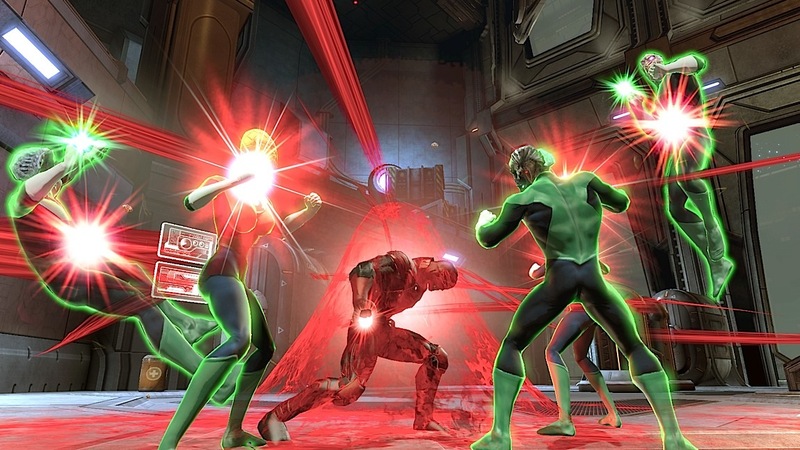 In the “Fight of the Light” DLC for DC Universe Online, the light powers of the Lanterns were presented, and players were able to get a taste of the formidable abilities of the power rings which Hal Jordan and Sinestro wielded in the original comics. In War of the Light – Part I, DC Universe Online now adds another light power that is driven by the red light of rage and which can be used both for good as well as for evil. Thanks to these rage powers, players will be able to master a whole new set of gaming mechanics for tanks and employ berserker-like abilities, giving a whole new strategic dimension to group content. In War of the Light – Part I for DC Universe Online, the Lanterns have destroyed the connection that all colors have with their emotional spectrum. Four Corps – Green, Blue, Sinestro and Red — have arrived on earth after receiving cryptic messages in order to discern their nature. The gathering of the Lantern Corps has incited a new War of the Light which centers on downtown Metropolis and the nearby sentient planets of Mogo and Ranx. Players must band together in groups of four to go on new high-level multiplayer adventures with Hal Jordan or Sinestro in order to investigate the light fog that has descended upon Metropolis and is influencing the emotions of its citizens. Additionally, brand-new 8-player operations will send players on raids on Mogo and Ranx, and during their investigations, the Green Lantern Corps will once again come up against the Sinestro Corps. New rage power – The new power set in the game is created from the red light of rage and can be used both for good and for evil. In the case of heroes and villains with tank powers, their skills will take on berserker-like characteristics. New 4-player operations – Strange color fogs have appeared and triggered a new War of the Light, and downtown Metropolis, Mogo and Ranx are caught right in the middle of it. With the help of friends such as Hal Jordan and Kyle Rayner (heroes) or Hank Henshaw and Sinestro (villains), players will have to get to the bottom of this mysterious fog. New 8-player operations – In these new raids, which take place on Mogo and Ranx, the investigation of the fog will result in a confrontation between the Green Lantern and Sinestro Corps. New legendary PvP characters – War of the Light – Part I presents two new lanterns – the violent Atrocitus and the agile Saint Walker. Legendary players of the game can download the DCUO DLC pack War of the Light – Part I right now for free. Free and premium players can purchase this latest DLC expansion via the DCUniverseOnline.eu website for EUR 8.99/GBP 7.99. ← Massive EVE Battle causes results in over £125,000 of property lost!